Liz Lothrop Update: Lizzy's counts were high enough Saturday night for a walk down the snow covered streets in our neighborhood! 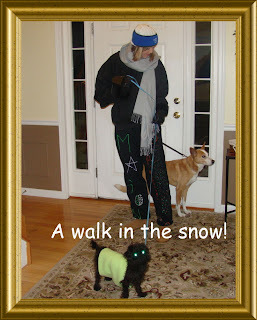 Lizzy's counts were high enough Saturday night for a walk down the snow covered streets in our neighborhood! Thats awesome. Maybe you'll be able to come up here eventually and we can walk through a foot of snow. Actually we only have about 3 inches but thats been constant since Thanksgiving. We see the lights to Bristol Mountain (remember we walked up it and Kat and I complained most of the way) now people are sking down it. I have a feeling that would be easier than hiking it in the summer. Miss you Liz. Keep your spirits high....Santa's watching. i love the pants . We are looking forward to Abuelos on Monday. :) We are praying for you always. Hi Liz! It's Coach VonBargen!! I'm glad to hear that you went for a walk!! It always feels good to get outside! I've been thinking about you a lot! I'll have to get over tovisi and bring you some chocolate chip cookies!! Take care!Have a wonderful Christmas!